In front of a close to sell-out crowd at the Malvern Town Hall former WBA interim world champion and current IBF # 3, WBC # 8 WBO # 12 Randy Petalcorin scored a devastating win with a first round knockout over two time Indonesian champion Oscar Raknafa. The left hook to the body of Raknafa sent a huge thud around Malvern Town Hall and Raknafa was down for over 10 minutes with suspected broken Ribs and was taken to the Alfred Hospital for an overnight stay. “I just checked on Raknafa he will go to hospital for a check up to be safe. 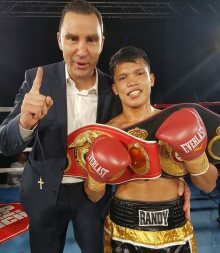 He is ok. Petalcorin hits like a heavyweight,” said Australian Promoter Peter Maniatis, “Randy will drop the former world champion tag in 2018 and at 25 years old I think he is the best light flyweight in the world. Maniatis also informed phlboxing that Terry Tzouramanis retained his Victorian super light title over Ismail Kerra winning on points in the semi main event. Petalcorin is now 28-2-1,21KO's, Raknafa drops to 13-16,5KO’s. Petalcorin trains in the Sanman Gym of Gen.Santos City, Philippines and was making his fourth appearance in Melbourne, Australia.